The first dance at this Kortright Centre wedding was a beautiful opportunity to take candid photos. While the bride and groom were doing their first dance, the ring bearer ran towards the newlyweds and hugged them. That was the cutest moment in the whole evening and the couple's reaction was priceless. They stopped dancing and interacted with the young boy. Even more interesting, the groom started dancing with the ring bearer and it dipped him instead of his bride. I captured this hilarious moment in a split second and this wedding album spread showcases precisely this moment. 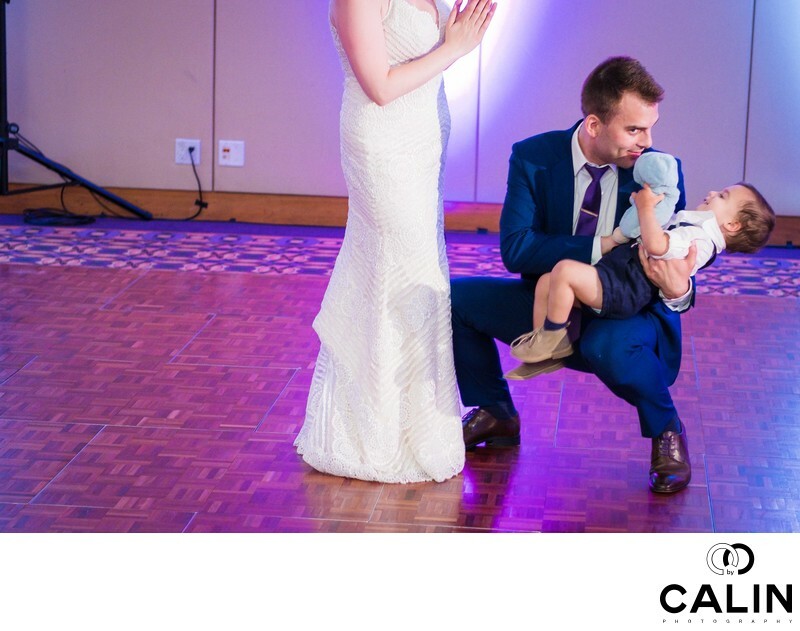 Even though before I placed myself in such a position so that I can capture both the first dance in the guests reactions, when I noticed the ring bearer run on the dance floor, I change position so I can catch this moment properly. light is the most important element in creating a great photograph. During the recession my lighting setup is very complex. Firs,t amounts two flashes onto light stands behind the subject to create a separation light. The are gelled with tungsten/CTO gels to blend seamlessly with the ambient light in the venue. Keep in mind that Kortright Centre uses tungsten bulbs and often the reception area is adorned with string lights that have a 2800 K temperature. Therefore, my gels are always a full CTO temperature. My main light in this case was coming from a continuous light source (video light) placed to my right just outside of the frame. That spotlight ensures that the subject is the brightest point in the scene. For my fill light I used an on camera flash also gelled with a full CTO gel. This photograph was taken with the 35 mm f1.4 lens mounted on my Canon 5D Mark III. the image was shot at F2 .5 and all the subjects are in focus. From composition perspective, this image is slightly weighted towards the right of the frame. Unfortunately, there was nothing that could give a visual balance in this image, such one of the guests placed on the left side of the frame. As the newlyweds and the ring bearer were in the same plane of focus, the subject is in isolated through a selective focus technique. The placement of the three people in the image against a plain backdrop ensures they stand out in the frame. In post production I cropped the image, adjusted the horizontals, performed colour correction, basic skin retouching and selective vignetting to draw the viewer's attention to the subject in this photograph. While the composition in this picture is not outstanding, this is still a phenomenal image as the emotion and the uniqueness of the moment definitely trump the ordinary location. Also, the fact that the bride is cropped just under her shoulders increases the mystery in this wedding album spread. The person looking at the picture with ask himself all this mysterious woman is. Even more important, the bride is positioned against a wall lit with a bright blue light which creates a perfect contrast between the bride's body in the background. This is so-called the figure to ground contrast of photography. As a photographer, one doesn't always have the luxury to compose properly is often things happen in a split second and a fast reaction and capturing the moment is more important than a perfect composition. I love immortalizing such moments and I noticed that more and more couples opt for a photo journalistic type of coverage on the big day. Truth be told, it is almost impossible not to direct a bit on the special day in order to create outstanding imagery however I would say that our style is about 90% documentary in just 10% posed. Immediately after the first dance, I invited the couple to take a few romantic photographs in the Glass House at Kortright Centre for Conservation that is one of my secrets spots at this wedding venue that they like to use whenever I shoot a special event here. The way we operate is this: during the reception myself and my second shooter tell the bride we are going out to scout the venue for a beautiful place where we can take some my charts. Prior to the big day, I always visit the establishment, but that usually happens during the day not at night when the light is completely different.